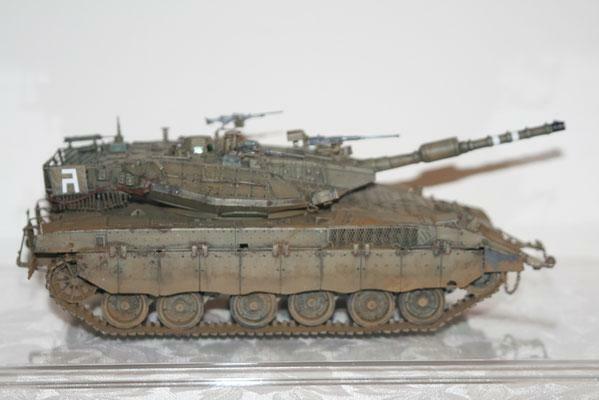 I am a real fan of IDF military equipment, especially their main battle tanks. 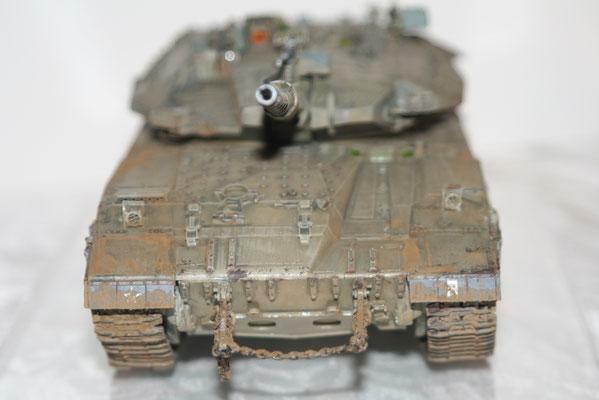 When the new company MENG offered a 1/35 Merkava Mk.3D as a newer release I just had to have it. 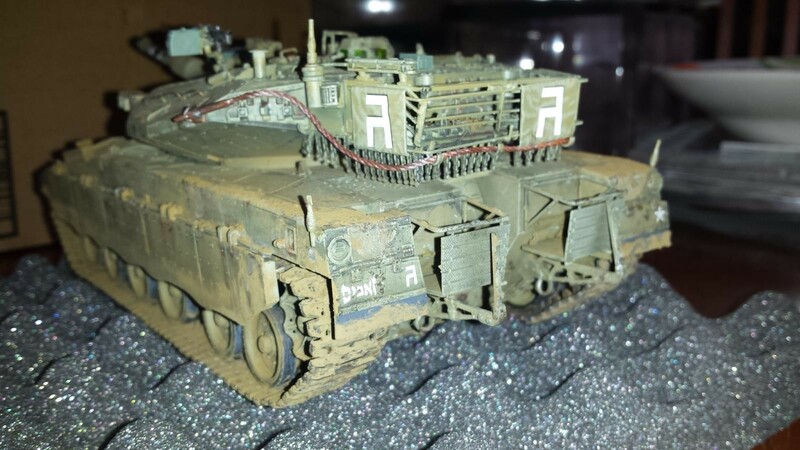 Prior to building this tank I did not know much about it but during the build I performed a good amount of research. 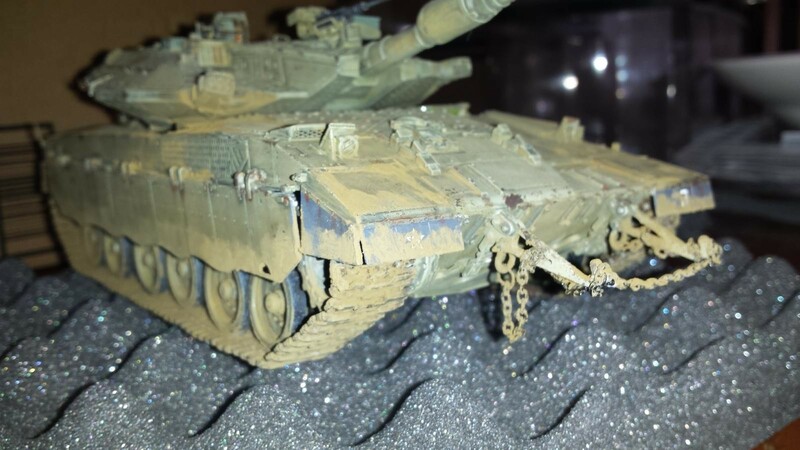 During this research I discovered that the tank’s performance is as good as it looks. 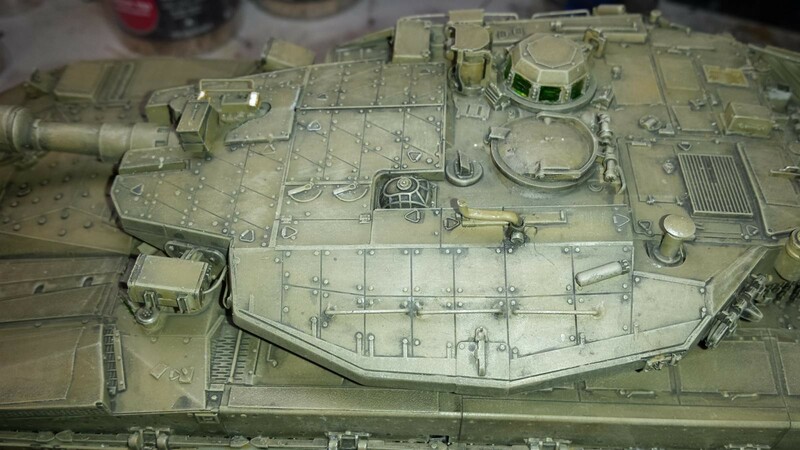 It has a real novel design concept with the biggest difference over other more common tanks is it’sfront mounted engine. 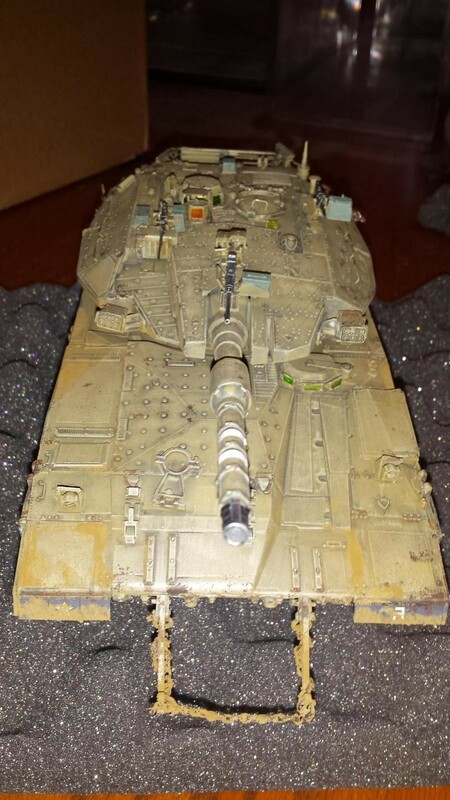 I think this war machine looks like it is fighting when it is standing still, and to me, looks like it would be more at home on the latest Star-Wars set then the middle-east desert. It is just that futuristic looking! Despite the high parts count and complex engineering the fit was good with no real issues encountered. 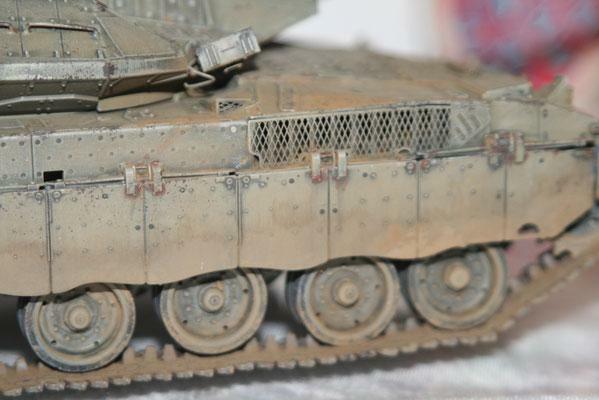 Some of the assemblies were a bit challenging but it is not a result of any fault in kit design. It is more just a feature of its complex shape, design, and high detail. 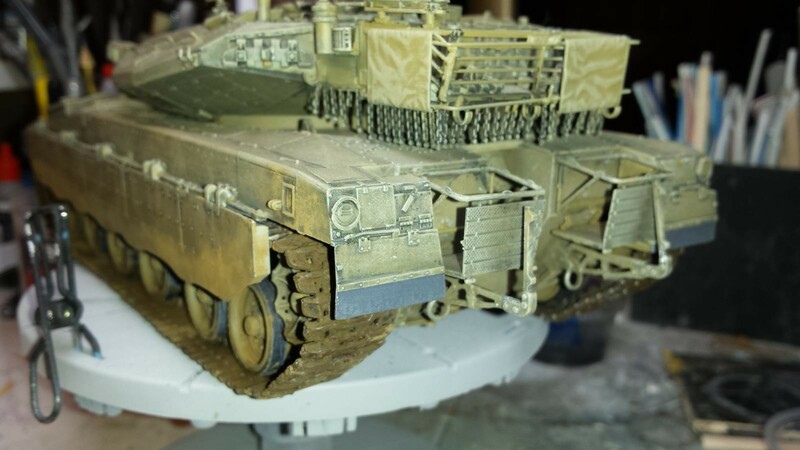 Some of the assemblies are very fragile and you must be very strategic regarding what you can attach during the build and what needs to be delayed and attached later in the process to avoid damage. I had an easier time with this build then I have had with some of the more complex Dragon armor kits. 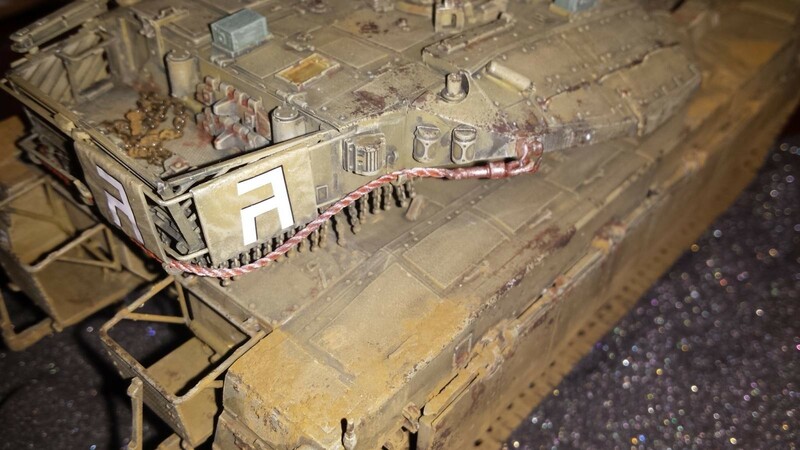 One aspect I really appreciated from MENG is despite the tracks being an individual link assembly each link was already cut from the parts trees and bagged separately. Each individual track link did not require any other parts; you just needed to connect the individual tracks to each other in a very conventional manner. 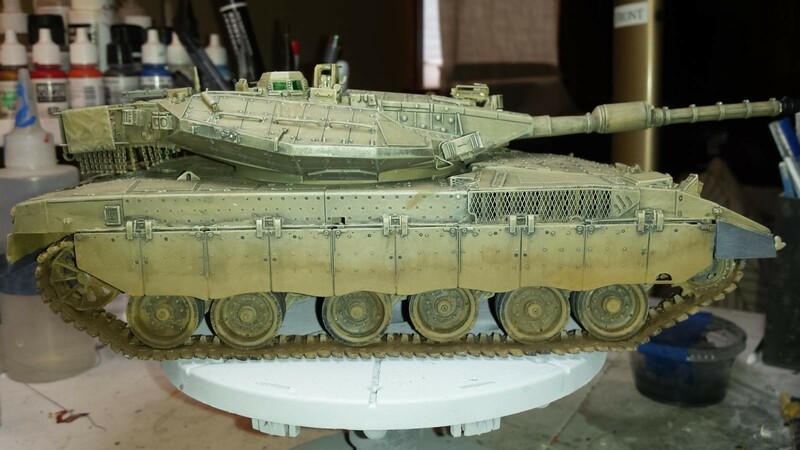 This was really a benefit for me because it is the 1st tank build I accomplished that did not utilize rubberized single rubber band tank tracks. 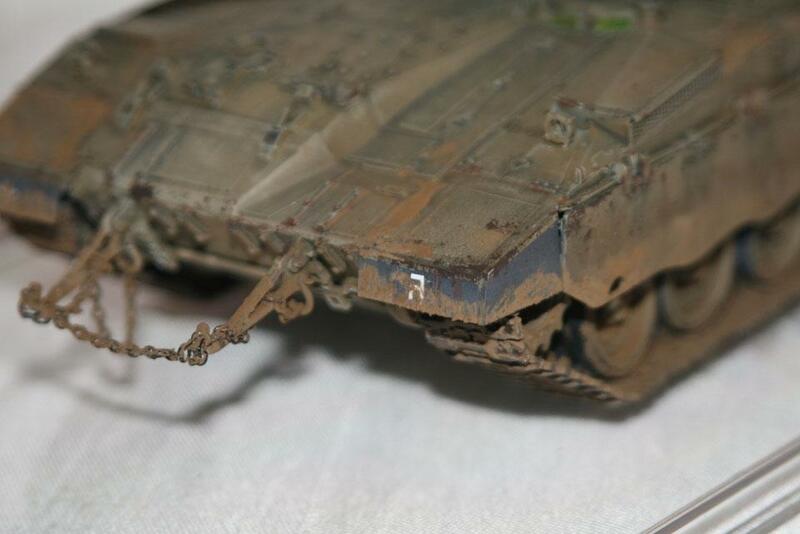 The kit could of benefited from a track building jig offered in some of the more modern tank kits, but I survived. 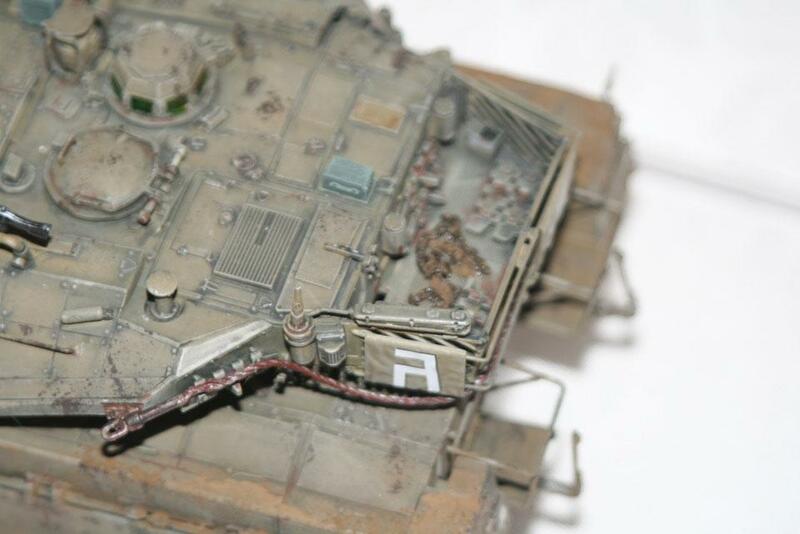 The other area that caused me some pain was the ball and chain armor located at the back of the turret. It is made all of plastic and they are pre-formed strips with the bracket, ball, and chain all molded together. Now this makes it very easy to assemble but it is very fragile. I should of waited tell the very end to attach because I broke parts off of this assembly repeatedly. After so many breaks in these parts I just could not repair any more. 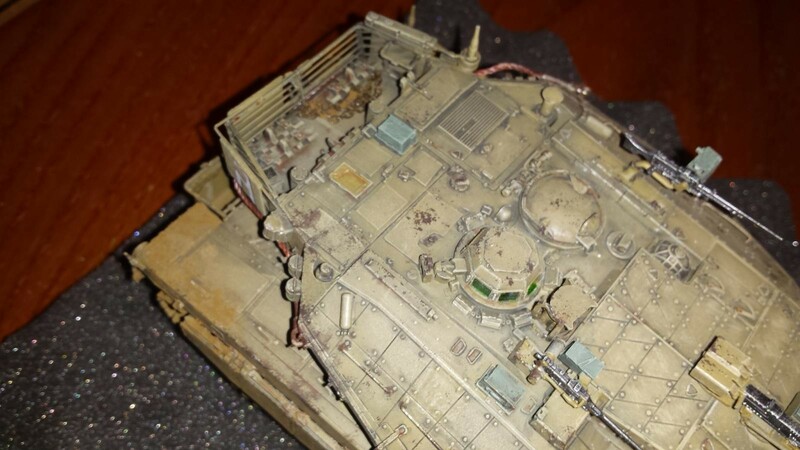 So you will see some missing ball and chain armor links. 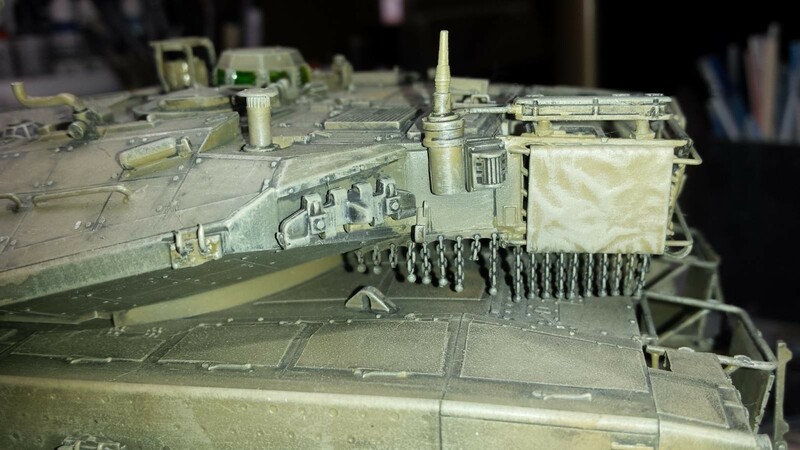 I even tried to install an after-market ball and chain set but that was a real nightmare to assemble each individual chain, attached to each individual ball and then attach each of these to the turret. There are a lot of these to assemble and attach. Call me chicken, but I just did not have the heart to do that towards the end of this build. 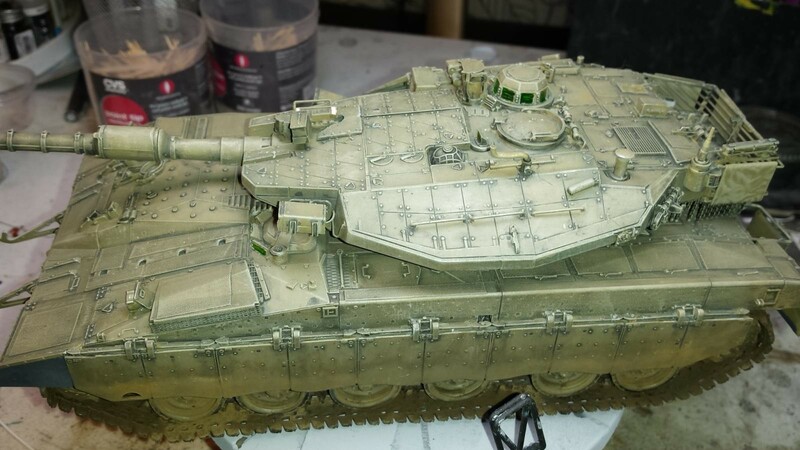 Maybe use it on a 2nd build of a different version of this tank. 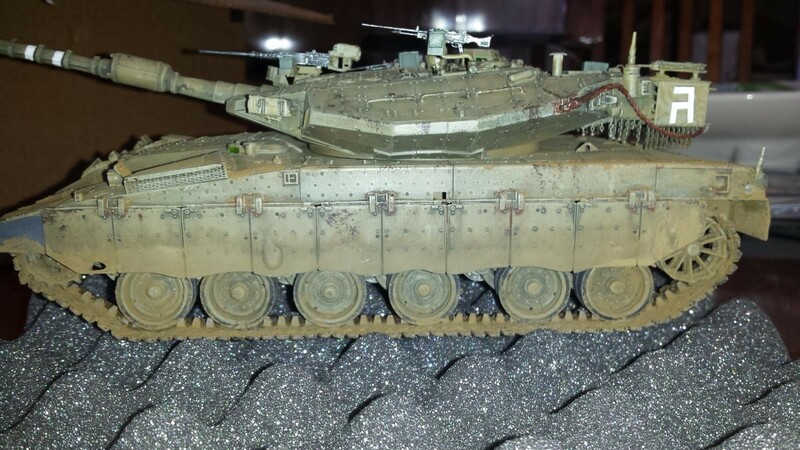 9 responses to IDF War Machine: 1/35 MENG MERKAVA Mk.3D Late LIC. 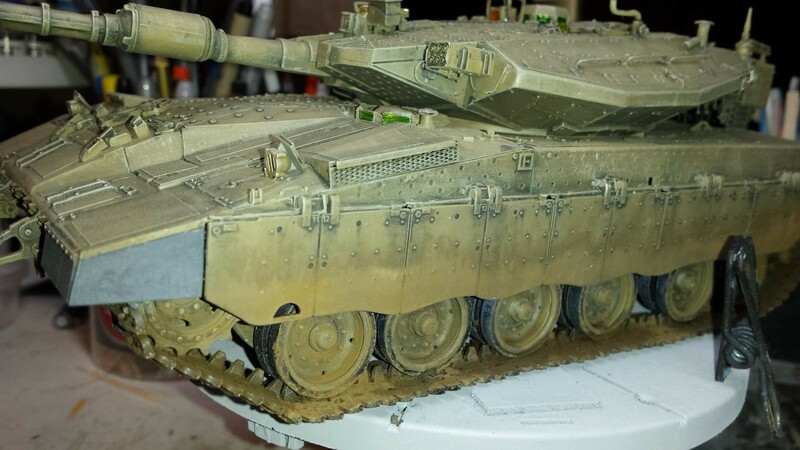 I’ve yet to build anything by Meng, but this and others sure look the part. Nice work. I’m with you Paul ,I love anything Israeli .Great job on the kit as well. 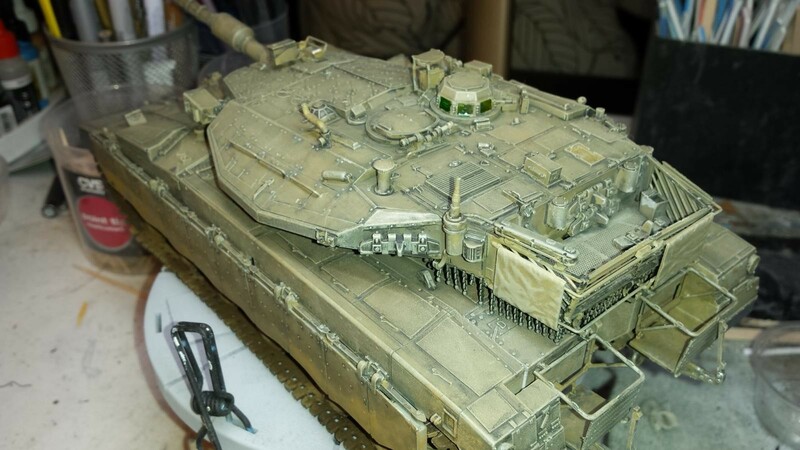 Very nice Merkava! 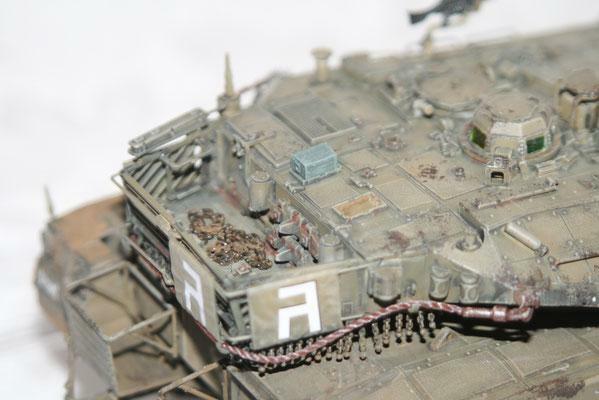 The IDF green is spot on as well, thanks for sharing Paul! 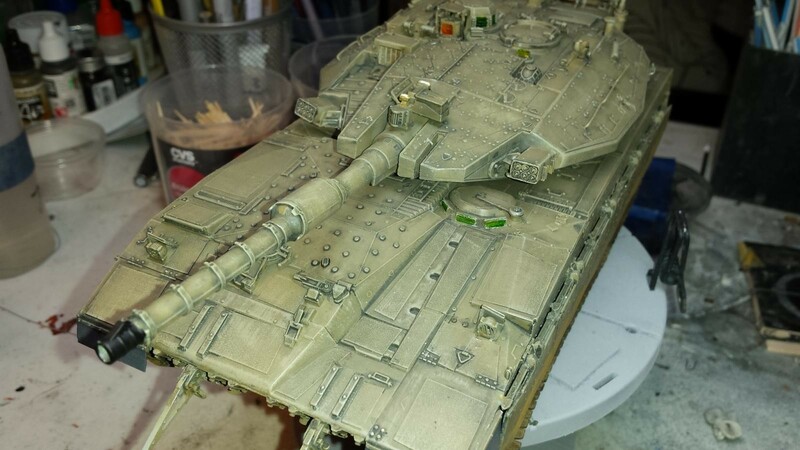 The Merkava looks great !!! 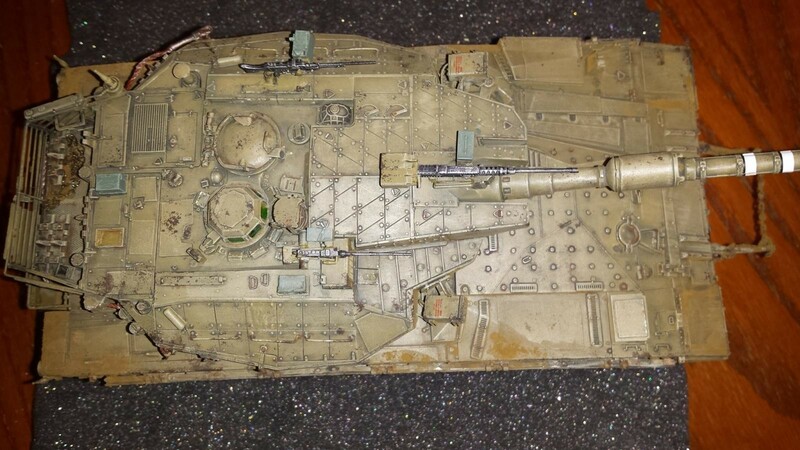 If I’m not mistaken, this one also has the capability to carry Infantry soldiers in the rear, where the engine is normally found in other tanks. 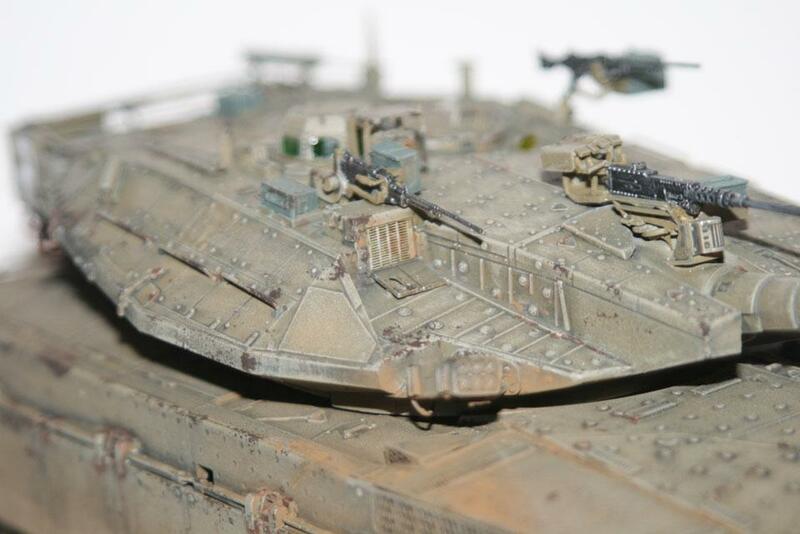 If you think about the concept behind this tank, it makes a lot of sense. 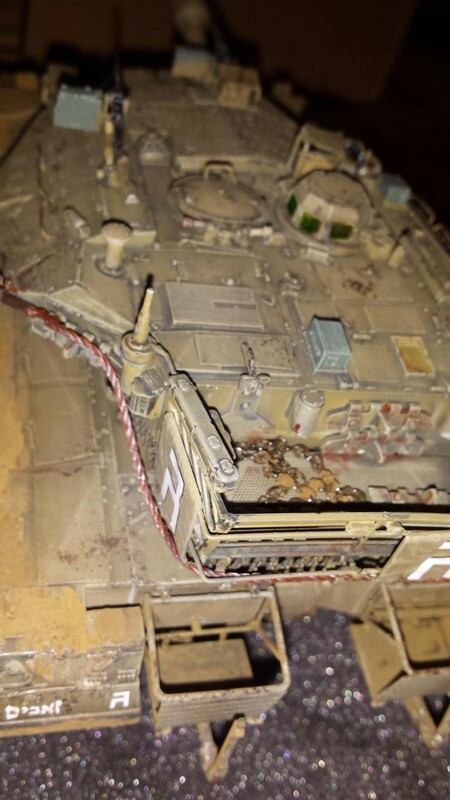 By placing the engine in front, if the front slope armor is breached, the engine would have to be penetrated before the incoming round would be able to enter the crew compartments. 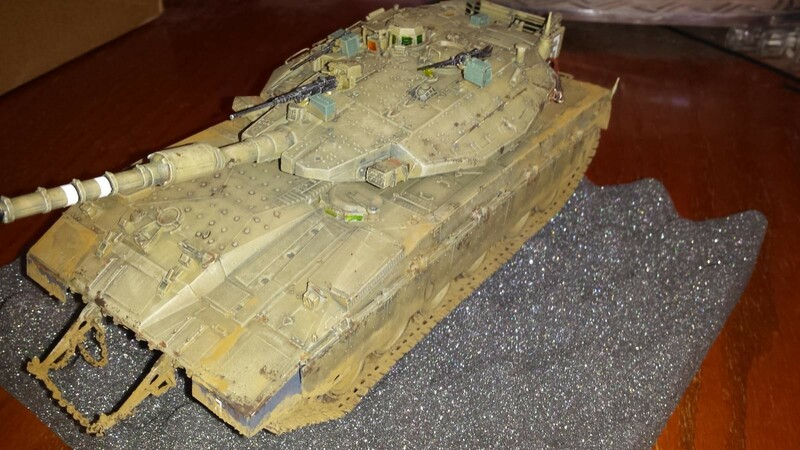 Hard to think of a tank as beautiful, but the Merkava (I think, “chariot”?) is beautiful. 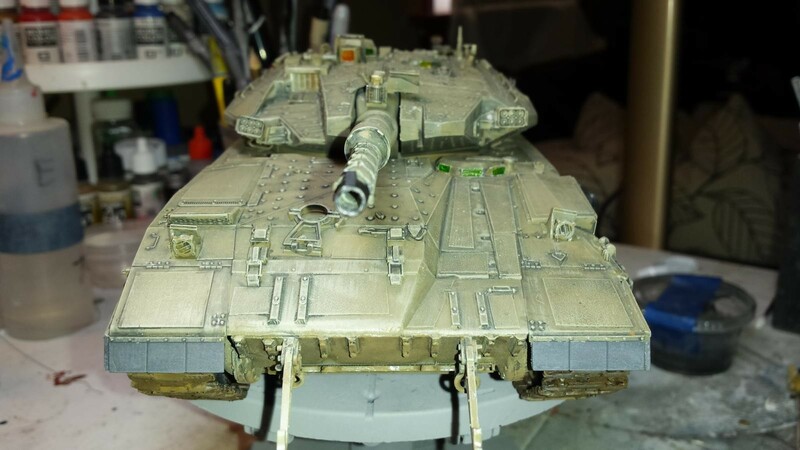 I did one about three years ago, posted here somewhere, and was pleased with the result. Nice attention to detail here, Paul. Great Merk, Paul! You have a way with armour, my friend. I agree with you that it looks futuristic. 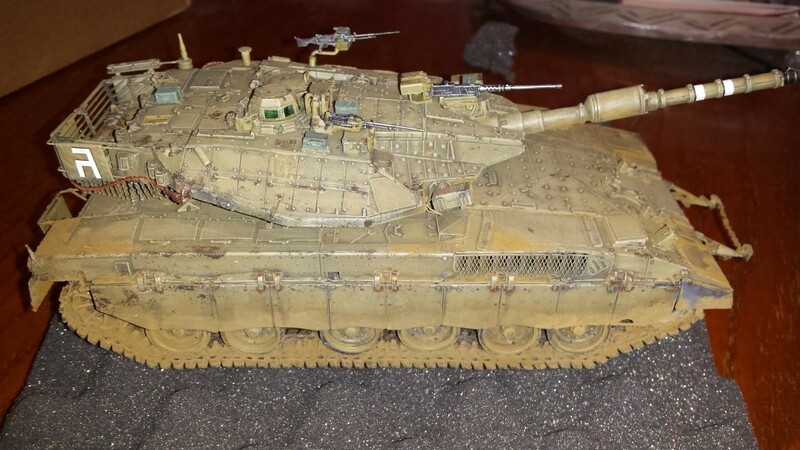 When I first saw a Merkava (photo – never in person, sadly) it took me back to around 1980 when I worked on the HIMAG project. 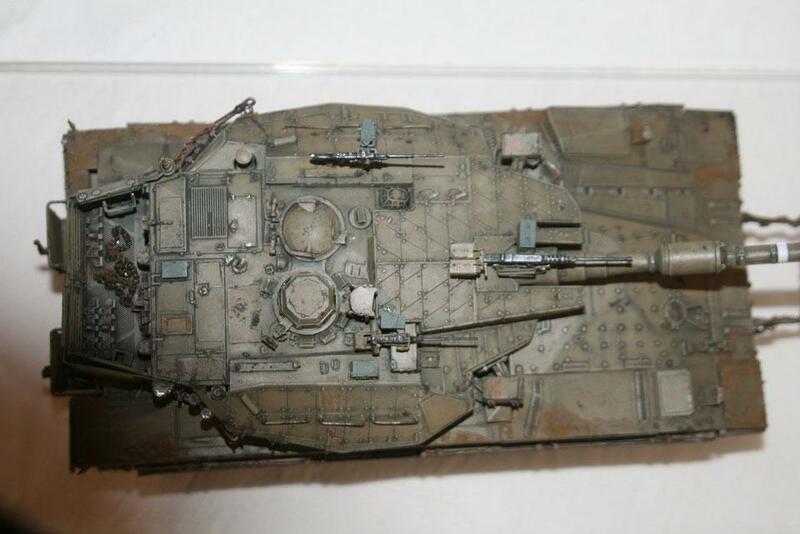 There was also a concept tank that is shaped VERY much the same as the Merk, only smaller. 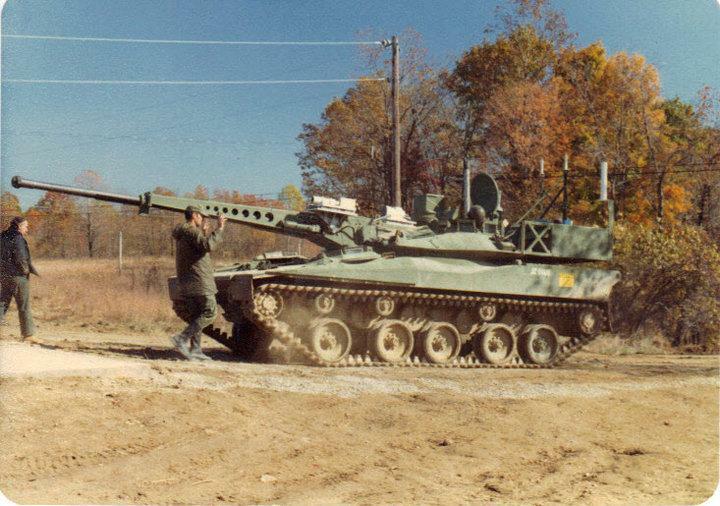 It was called the HSTV-L, or HIgh Survivable Test Vehicle – Lightweight. 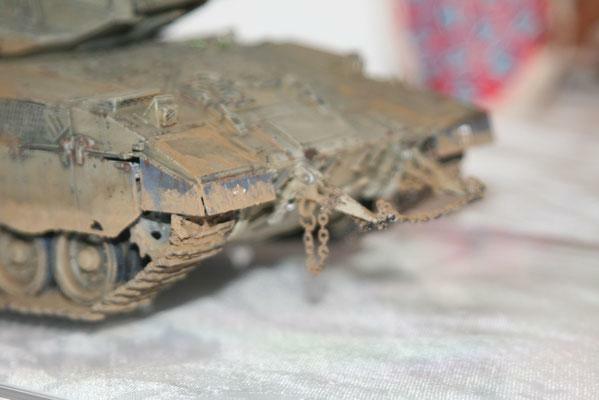 The weathering on your Merk is right on the mark, my friend. Great job! 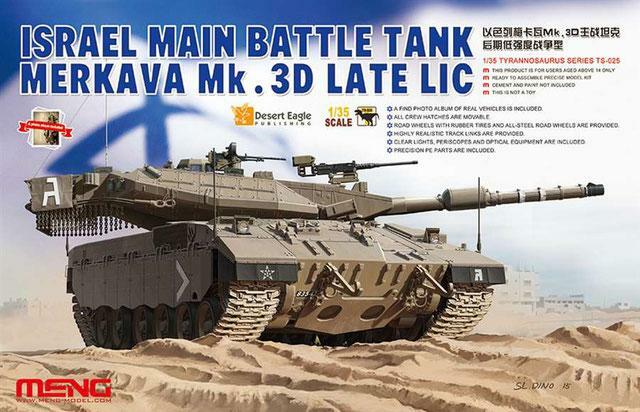 Meng have really gone to town with their armour kits and the Merkava is a classic design. 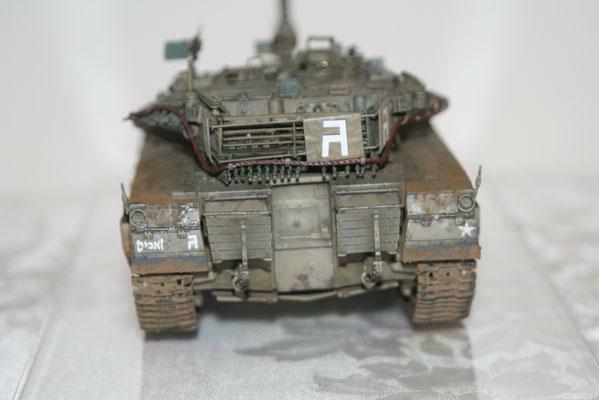 You’ve certainly captured the look of the real thing with this model. 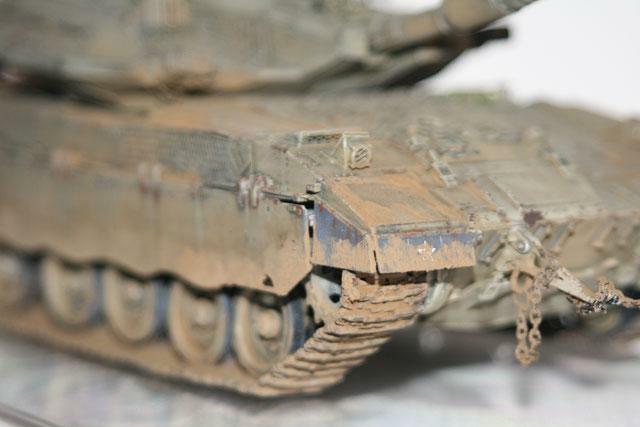 A real beauty – your weathering and details are smashing!